I'm transforming purpose to action during National FFA Week with Central Indiana! Tonight I traveled mile 224 of 929 miles that I will drive during National FFA Week. When I turned my car off after parking at mile 224, I found my heart so full. Full of love from all of the amazing FFA members, advisors, and supporters I have already seen this week. Not only was my heart full, but by mile 224, I had gathered quite a few items that were truly symbolic of my visits so far. 1 plastic cup that I took home from the Community Breakfast with the Mt. Vernon at Fortville FFA Chapter. My job that morning was to fill drinks, so needless to say I spent a lot of time with these cups. 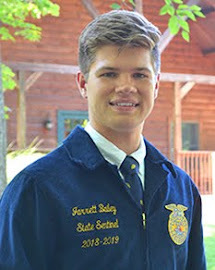 While this was my job, I think I spent more time getting distracted by talking to all of the amazing FFA members, advisors, alumni, and community supporters. Just some of the amazing members at the Mt. Vernon at Fortville Community Breakfast. 2 Skyzone socks were on my passenger’s seat from my time with the Greenfield Central FFA Chapter. Skyzone may have made me realize how out of shape I was, but it was worth it to make memories with these members. From the crazy bus ride to conquering my fear of jumping on the wall, I will always think of them when I see the bright orange socks. A memorable bus ride with the Greenfield Central FFA Chapter, love getting to make memories with these great people. 1 church program was taken out of my jacket pocket after attending Wilkinson Church of Christ with the Eastern Hancock FFA Chapter. I loved being able to experience one of their chapter traditions of going to church in celebration of FFA week, but also to try out the legendary “Gas Grill” for breakfast. Blue jackets filled rows at church on Sunday morning because of Eastern Hancock FFA members who celebrated National FFA Week with this tradition. 1 parking garage receipt found its way to my car after spending Page Day at the Indiana Statehouse. My teammates and I had the opportunity to see over 80 Indiana FFA members from all over the state come to spend the day learning about state government, sharing their agriculture story, and meeting other members, by serving as Pages for our government officials. Standing outside of the Office of Lieutenant Governor Suzanne Crouch after an awesome meeting with her, and a great time at Page Day. 2 pairs of funny teeth were just one of my prizes from my evening competing in the Ag Olympics with the Indian Creek FFA Chapter. While I may not have actually won an event, I had a ton of fun trying. From seeing the girls vs boys competitions, to spitting oranges across the room, this is one prize I’ll always keep. Trying out my prizes after not winning a single event at Indian Creek's Ag Olympics! As I embark on mile 225 tomorrow morning, I am beyond excited to travel to the rest of my visits, complete media interviews, and celebrate the best week of the year. Happy National FFA Week! February 14th – a day many couples look forward to each year (and many singles dread). Celebrations across the world include purchasing flowers, cards, and candy for those who mean a lot to them. According to statisticbrain.com, over 198 million roses were sold on Valentine’s Day, making it the number one holiday for florists. As I scrolled through social media, my heart was full as I saw others boast about their significant others, families, and friends. But why does it have to stop on February 15th? While at home this past weekend, I asked my four-year old sister Emma if she was excited for Valentine’s Day. She responded, “YES! 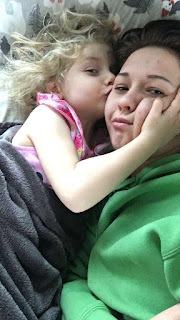 But I love you every day.” That little girl has taught me so many lessons, but I think what she taught me that day will stick with me forever. We focus so much on the materialistic gifts and items we may or may not receive on that special holiday, but we often lose focus on the thing that we are actually celebrating – love. Don’t get me wrong – I appreciate receiving the flowers and the gift cards, but I think that it is so important that we don’t overlook the people who are giving them to us. I am thankful for those special people each and every day and Emma made me realize showing that love shouldn’t just happen on the fourteenth of February. Emma shows her love each time I'm with her! Throughout this year, our team has been shown love from all types of people – members, family, mentors, staff, teachers, sponsors, stakeholders. No matter what we endure, we know that we have over 12,000 Indiana FFA members and thousands of others who support us and are there to encourage us in all that we do – and for that, we are thankful. I challenge you to look beyond the flowers, cards, and other items you may have received this past Tuesday. Sit back and think about all of those who have helped you and those who have shown you love. As you look forward, remember to continuously show your love and appreciation for all that they do. To those who have helped to push me to be the person that I am today – thank you, I truly appreciate all you do! Like many words in the English language, the word “backbone” has various definitions. Yes, a backbone is technically a spine but another definition of backbone is “the foundation or the most substantial or sturdiest part of something.” When we think of a figurative backbone, we may think of someone who supports, encourages, and believes in us. These people may be our parents, siblings, best friends, teammates, or advisors. I’m lucky to say that my backbone consists of all of these people. 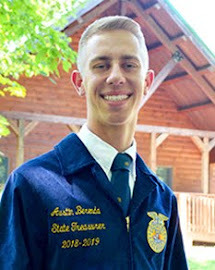 When we think of who the backbone of FFA is, what comes to mind? 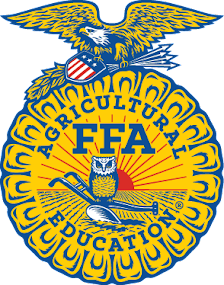 After some thought, I’ve determined that the backbone of this organization are the FFA chapters. This past weekend, my teammates and I had the opportunity to help strengthen the backbone of Indiana FFA by facilitating the Winter Leadership Development Workshop. 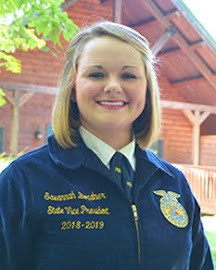 During this leadership workshop FFA members learned how to recruit new FFA members, how to plan successful events, and most importantly how they can investigate the impact they have in order to develop a stronger FFA chapter. My teammates and I were able to witness these chapter officers positively grow together in order to provide the best for their chapter. Not only during this weekend, but throughout the whole year I’ve witnessed the talent, passion, and dedication that FFA chapters have. Chapters not only provide the best opportunities for its students, but it provides a place to call home when home feels a little too far away. The FFA chapter I call home. 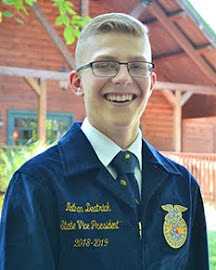 From the 208 FFA chapters chartered in Indiana FFA to the 7,859 FFA chapters spread from Alaska to the Virgin Islands and from Maine to Hawaii, each individual chapter is unique in their own way, yet similar way. 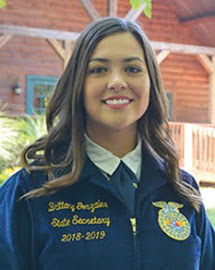 They all possess diverse FFA members with different backgrounds, yet they all work to grow leaders, build communities, and strengthen agriculture. The Benton Central FFA Chapter! The South Newton FFA Chapter! 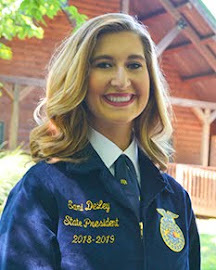 Without FFA chapters, its students, and its advisors, this organization wouldn’t be able to live out its mission and vision statement the way we do. With that being said, thank you to every FFA chapter for serving as a backbone. 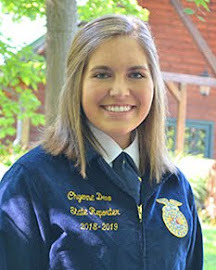 A backbone to Indiana FFA, to the National FFA Organization, to the State Officers, and to its members.